Polish your panes with a fresh cleaning technique that has met the demands of over 94% of our customers in Morden! A: Your panes will be treated by a team of certified and background-checked window cleaning technicians. Q: What services does window cleaning Morden provide? A: The professionals will achieve exterior window cleaning with the help of the latest water-fed pole technology on the market. For buildings above the fourth floor, we'll send in experienced abseilers for rope access window cleaning. For interior pane polish, the team will resort to standard ladders and squeegees. Q: Can you still remove smeared dust on a cloudy day? A: A couple of of raindrops won't disrupt the Morden window cleaners' work – rainwater is usually mud-free. However, if we face a downpour, then we will kindly ask you to re-schedule your booking for another day. Q: Can you rejuvenate my PVC window components as well? A: Yes, any PVC or UPVC frames and sills that your building features will be cleaned with no extra charge as part of our service. Q: Can you perform your service when I'm not at home? A: As long as the specialists can pass through your front gate, they can rinse away all grime without you having to be close by. If your panes need a proper inside polish as well, then we'll arrange a fast key pick-up and delivery service. A: Usually, the filtered water container inside the team's washing van is always full. In case the tank is empty and with your approval, the cleaners can easily attach the water-fed pole to any accessible water source. Q: Do I need to meet any particular prerequisites before the team knocks on my door? A: Once we tell you that the team's on their way, you'll need to ensure that they can enter your domain unimpeded. In addition, the technicians will need a parking spot within 30 metres from your property and on the same side of the panes you want cleaned. A: If the team is nowhere to be seen because of serious traffic, we will tell you about the hold-up and get in touch with you as soon as they arrive. For the past ten years, our window cleaning Morden service has always brought satisfactory results at the most competitive prices in your region. You can find our prices in our short price table below. Based on your needs, our window cleaning Morden can offer you with three alternatives. 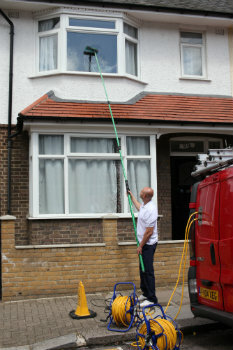 If you pick external cleaning, the technicians will make use of a special water-fed pole. This gear can expand up to 22 metres in length, which is equivalent to the height of a four-storey property. The Morden window cleaners will use distilled water under high pressure that will blast away all streaks in little to no time. If you have a multistorey property instead, then go for our rope access window cleaning. There, a team of licensed climbers will diligently clean your windows until they spot the mirror image of the setting sun. For your comfort, we check the washing equipment on a frequent basis and can send COSHH reports at your request. For interior washing, the specialists will use ladders and sponges to ensure that even the highest spots will get proper treatment. Do any of your family members need help with washing away persistent window stains? Scroll down to learn which regions the Morden window cleaners frequent. Another quick and easy way to get a free instant quote or to book window cleaning services Morden SM4 is through our web site.